Senior Vice Commander Roger Nason (left) and Commander Dan Meehan (right) receive the New Hampshire Preservation Alliance’s Preservation Award. 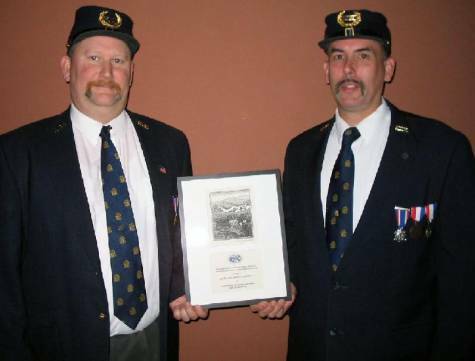 On Nov. 8,2005 Charles W. Canney Camp #5, Sons of Union Veterans of the Civil War received a Preservation Award from the New Hampshire Preservation Alliance. Three years ago Charles W. Canney Camp No. 5 began reaching out across the state to help New Hampshire communities restore Civil War monuments honoring Union soldiers. When they hear about a statue in need of their services, they help to raise funds for restoration; all of the money raised goes to the preservation project. Camp members focus their attention on educating schoolchildren as stewards of the next generation. Their efforts have restored community landmarks in Raymond & Candia. “This mentoring offers an excellent grassroots model for how communities should plan for, and execute, local preservation projects,” said Jennifer Goodman, executive director of the Preservation Alliance. The awards were announced at the Preservation Alliance 20th Anniversary celebration in Concord. Since 1989 the awards have recognized outstanding preservation projects. The New Hampshire Preservation Alliance is the statewide organization dedicated to preserving historic buildings, communities and landscapes through leadership, education and advocacy. Current priorities include providing training and technical assistance to community leaders as well as promoting barn preservation, the use of easements and funding for the Land and Community Heritage Investment Program.